Maybelline Color Sensational The Loaded Bolds Lip Color in Dynamite Red, Fiery Fuchsia, Rebel Pink, & Berry Bossy with Creamy Matte Lip Color in Craving Coral & Siren In Scarlet. Both of the Maybelline Color Sensational The Loaded Bolds Lip Color & Creamy Matte Lip Color Lipsticks retail for $7.49US, $7.96CAN at Walmart, and $11.49CAN at Shopper Drug Mart for 4.2g/0.15oz of product. Maybelline Color Sensational The Loaded Bolds Lip Color in Dynamite Red , Fiery Fuchsia, Rebel Pink, & Berry Bossy with Creamy Matte Lip Color in Craving Coral & Siren In Scarlet. Isononyl Isononanoate, Octyldodecanol, Oleyl Erucate, Silica, Cera Alba / Beeswax, Phenyl Trimethicone, Synthetic Wax, Sesamum Indicum Seed Oil / Sesame Seed Oil, PEG-45 / Dodecyl Glycol Copolymer, Paraffin, Cera Microcristallina / Microcrystalline Wax, Kaolin, Disteardimonium Hectorite, Dimethicone, Tocopheryl Acetate, Pentaerythrityl Tetra-Di-T-Butyl Hydroxyhydrocinnamate, Alumina, Aluminum Hydroxide, Benzyl Alcohol, Mel / Honey, Calcium Aluminum Borosilicate, Synthetic Fluorphlogopite, Calcium Sodium Borosilicate, Polyethylene Terephthalate, Tocopherol, Hydrogenated Palm Glycerides Citrate, Acrylates Copolymer, Tin Oxide, Parfum / Fragrance. 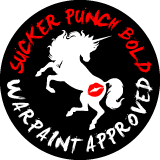 May Contain: Mica, CI 77891 / Titanium Dioxide, CI 77491, CI 77492, CI 77499 / Iron Oxides, CI 45410 / Red 28 Lake, CI 45380 / Red 22 Lake, CI 15850 / Red 7, CI 15985 / Yellow 6 Lake, CI 19140 / Yellow 5 Lake, CI 42090 / Blue 1 Lake, CI 75470 / Carmine. Isononyl Isononanoate, Octyldodecanol, Oleyl Erucate, Silica, Cera Alba / Beeswax / Cire Dabeille, Phenyl Trimethicone, Cera Microcristallina / Microcrystalline Wax / Cire Microcristalline, Synthetic Wax, Sesamum Indicum Oil/Sesame Seed Oil, PEG-45 / Dodecyl Glycol Copolymer, Kaolin, Disteardimonium Hectorite, Dimethicone, Tocopheryl Acetate, Pentaerythrityl Tetra-Di-T-Butyl Hydroxyhydrocinnamate, Alumina, Benzyl Alcohol, Mel / Honey / Miel, Parfum / Fragrance. May Contain: Mica, CI 77891 / Titanium Dioxide, CI 77491, CI 77499 / Iron Oxides, CI 15850 / Red 7, CI 45410 / Red 28 Lake, CI 45380 / Red 22 Lake, CI 15985 / Yellow 6 Lake, CI 42090 / Blue 1 Lake. Maybelline The Loaded Bolds Lip Color formula is actually similar to the Creamy Matte Lip Color formula (The base formula is the same) but less dense feeling. The pigmentation and glide are very similar and it not hydrating but not drying either. 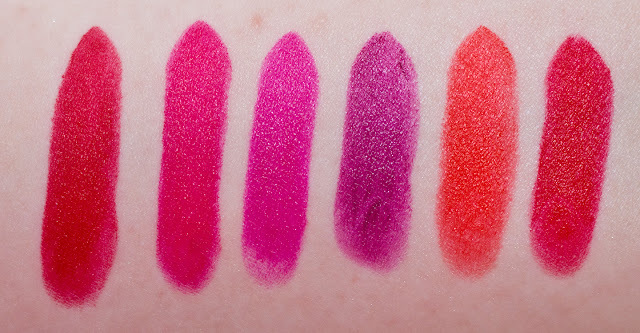 They are a slight cream sheen to the lips while wearing it. 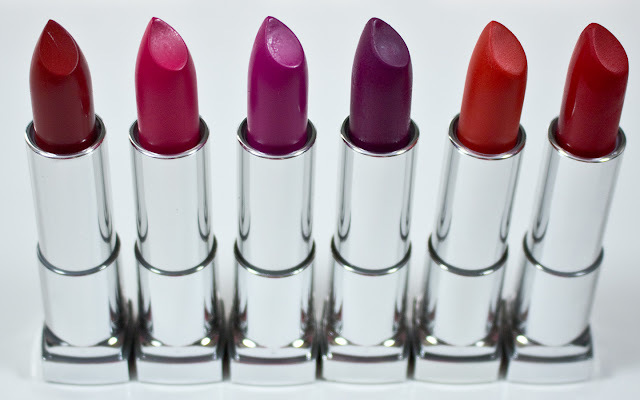 The Creamy Matte Lip Color formula is very pigmented smooth to apply on the lips. The feeling on the lips is not hydrating but also not drying as you wear it. This formula also looks matte after applying it to the lips. Dynamite Red is a true pure red with a cream finish. Fiery Fuchsia is a hot magenta with a cream finish. Craving Coral is a orange-red with a matte finish. Siren In Scarlet is a warm light red with a matte finish. Wear: For about 6-8 hours before needing a touch-up. 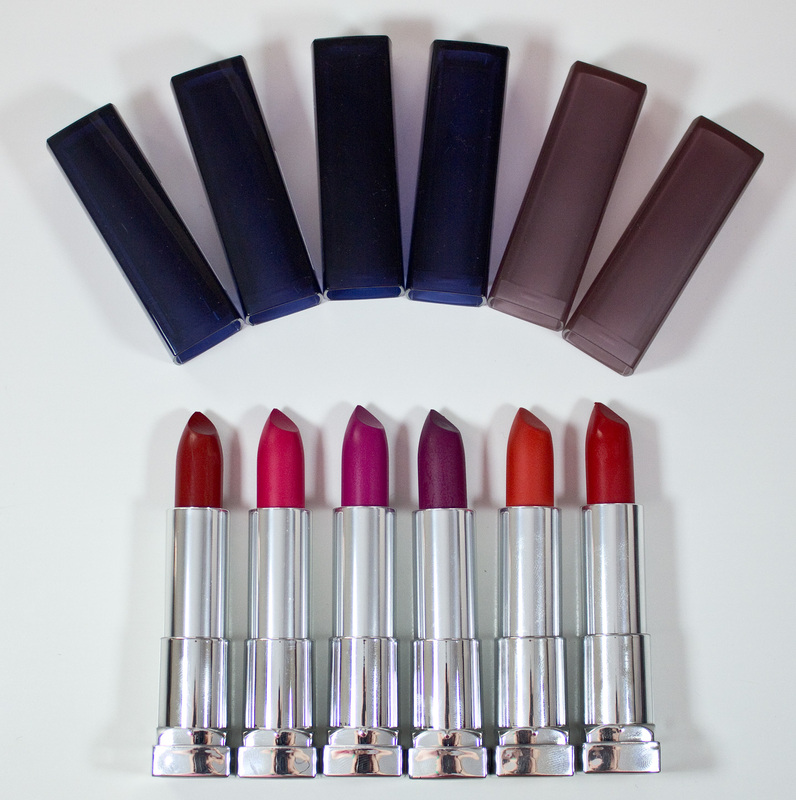 Packaging: Is a basic lipstick bullet tube with the deep blue lids and duty mauve lids that slides down to the base. 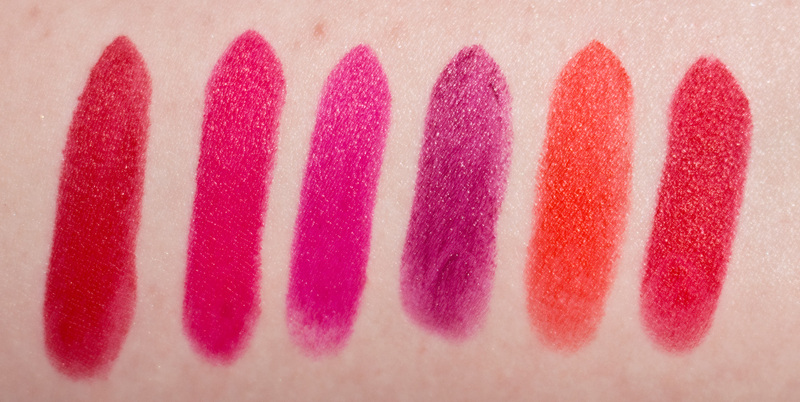 The Loaded Bolds Lip Color in Dynamite Red, Fiery Fuchsia, Rebel Pink, & Berry Bossy. Creamy Matte Lip Color in Craving Coral & Siren In Scarlet. The Loaded Bolds Lip Color in Dynamite Red, Fiery Fuchsia, Rebel Pink, & Berry Bossy. Creamy Matte Lip Color in Craving Coral & Siren In Scarlet. I want more shades up here still from both these formulas! All these shade are very comfortable to wear on the lips and last a good amount of time.